There is a 50% chance most folks will be home in a nuclear attack, a 25% chance they will be at work and a 25% chance they will be somewhere else, so learn the locations of shelters near places you spend time. Distance from fallout particles and amount of shielding material between you and fallout particles make for an effective shelter against radiation. Shelters can be built even at homes without a basement. If this is your home, check out the Under-Slab Shelter. Shelters do not need complicated air filtration systems to protect against fallout. A wet bedsheet will do in a pinch. When Americans use the term “bomb shelter” we are usually referring to a “nuclear fallout shelter” and, much like firearms, people either understand the need for them or they do not. A nuclear exchange would entail great loss of life, and many people are so overwhelmed by the prospect, that they immediately throw up their hands and surrender, leaving their fate, and the fate of their loved ones, to chance. This is not an effective survival strategy. The fact is, many people would survive a nuclear strike. Hiroshima and Nagasaki taught us that people will survive even within the blast radius. Why people would give up at that mere mention of the threat is perhaps best explained by Dr. John Leach. In the book, Survival Psychology, Leach describes the 10/80/10 rule. The rule postulates that approximately 80 percent of people will stand around like statues in the wake of catastrophe and do nothing. A mere ten percent of survivors take effective action to save themselves and others. The last ten percent loses composure and engages in actions to the detriment of themselves or others. Bomb shelters are built by people who are not paralyzed by normalcy bias, the informed and the educated. In my experience, the negative stereotype of the paranoid, bunker-dwelling survivalist is an overblown machination of writers and TV producers. Pattern of life is a key consideration when deciding shelter placement. There is about a 50% chance that the average American will be at home when a nuclear strike occurs, a 25% they will be at work and a 25% chance they will be somewhere else. Thus, the odds are only 50/50 that a commuting shelter owner would be able to use their own shelter. Understanding pattern of life, a grasp of expedient shelter principles is clearly paramount even for survivalists who own shelters. Geographically, most of the area affected by a nuclear blast is affected by nuclear fallout. The area affected by the blast wave and heat are comparatively much smaller. Most DIY shelters are fallout shelters as they are not capable of withstanding the overpressure of the blast wave. Most blast shelters are commercially engineered and manufactured. In the event of a nuclear attack, there may or may not be any warning. Some delivery methods can be detected, while others cannot. Citizens may receive 5 minutes to an hour of warning if the attack comes from missiles and bombers. It is very likely that a nuclear attack would be preceded by an HEMP attack. If this happens, we may hear that a single missile is in the air before communications fail. If an HEMP is caused by a satellite that is already in orbit, there would be no warning at all. Either way, most radio, TV, Internet and cellular communications would all suddenly go dead. If the attack were to be preceded by aggressive military posturing, people who understood the threat might have time to construct expedient shelters, but once missiles are in the air, there may not be enough time to finish a shelter before the warheads reach their targets. If you receive a warning, it will likely be through NOAA All-hazards Radio, a Wireless Emergency Alert to your cellphone or via an Integrated Public Alert System broadcast. Some communities maintain sirens, but the USA is less prepared for nuclear war, and more vulnerable to HEMP, than any other time in our nation’s history. Density and thickness of the shielding between you and the fallout particles. Fallout particles are like dust or ash. Fallout is lofted into the air during a nuclear strike, are borne on the wind and then settle back to earth, accumulating on any exposed surfaces, including you. If you are inside your home, the particles will settle on the roof of your home instead of on you. The distance between you and the fallout would offer a degree of protection. If your house is a single-story structure, it will offer less protection than a two or three-story structure would. Because fallout will also settle onto the ground and walls of your home, it would be best to take shelter in the center of the home or the point furthest from the fallout. More important than distance, is shielding. Brick, stone or poured concrete offers a great deal more shielding than wood and sheetrock. If the structure has a basement, choose a wall that is protected my earth from floor to ceiling where possible. Homes which are attached to other homes offer additional protection. The more wall that are attached, the greater the protection offered. Because the effects of fallout are cumulative, some protection is better than no protection. The space under a stairway can be modified for use as a fallout shelter. Pile bricks, concrete blocks or sandbags on the steps for overhead protection. Then do the same along both sides of the stair where it meets the floor. Book cases or storage racks can be secured to the sides of the stair to help support the weight. 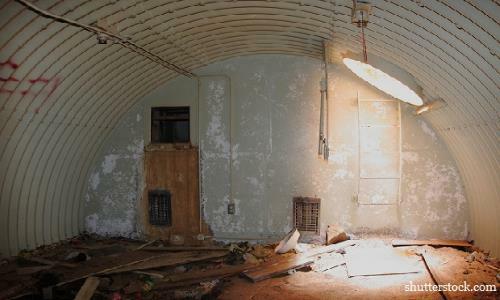 Once they are filled with blocks, bricks or sandbags, face them with plywood or doors taken from other rooms to secure the shielding material in place. Lastly, use the same technique to shield the open end of the stair, leaving room for a door. If space allows, a second, wall can be constructed to create a baffle in the entry. A serviceable improvised shelter can even be built under a cracker box slab home without a basement. Dig a trench along the side of the home, exposing the foundation. Excavate up under the foundation so that the slab overhangs the excavated cavity by no more than four feet. Support the foundation with cribbing and screw jacks, if available. Pull doors off the home and lean them against the side of the house, creating a lean-to shelter over the trench. The foot of the doors should be just inside the trench for stability. Cover the doors with plastic sheeting or tarps to keep the trench from filling up with rainwater. Pile the dirt removed from the excavation on top of the concrete slab over the shelter and over the doors, creating an earthen ramp against the side of the house. Dig an ‘L’-shaped trench or dugout for a simple, no-frills shelter. The longer side of the ‘L’ will serve as the shelter and the shorter side will be the entrance. Placing the entrance at a right angle helps reduce the amount of radiation that will enter through the door. This principle can be used on many of the other shelter designs. Construct a roof, cover it with tarps or plastic sheeting and mound up earth removed from the trench over the top. If material is available, a more serviceable shelter can be constructed by lining a trench with a long box-shaped structure made of plywood, covering it with sheeting and then backfilling earth along the sides and mounding earth up over the roof until it is about two feet thick. Homes that do not have basements, sometimes have crawlspaces that can be utilized. Cut an access into the crawl space and dig a trench shelter. A car or tuck can be used as a field expedient shelter by parking it over a trench so that the vehicle acts as a roof and then filling in the space between the ground and the vehicle’s body with sandbags, earth or another available material of sufficient density. If a suitable trench or irrigation ditch cannot be found, a trench can be excavated. Construct the trench in an ‘L’-shape in the same fashion as the trench shelter. If caught on the water, a boat with a cabin can offer a degree of protection against fallout. Anchor the vessel in deep enough water so that there is at least 5 feet of water between the bottom of the boat and sea, lake or river bottom. Then prepare buckets or hoses and a pump. Shelter as low in the vessel as possible. Go topside a few times a day to wash fallout off roof and deck. Fallout particles will sink to the bottom once washed off and the water will provide shielding between the vessel and the fallout collecting on the bottom. Periodically washing the fallout off the decks and roof will reduce the accumulation of fallout, reducing the exposure of the occupants. The USA tested nuclear weapons on a massive scale in the 1950’s and 60’s. Mock homes and buildings were constructed, bombed with nuclear weapons and the results studied. Unpainted, cluttered homes in poor states of repair were constructed side by side with well-maintained and ordered homes. A nuclear weapon was detonated, and the results were filmed. The difference in damage was quite remarkable. The homes where exposed to the heat and overpressure of the blast wave. Clutter, garbage and unpainted wood in and around the poorly maintained homes burst into flames, while the well-maintained homes faired visibly better. Store fuels, such as wood piles and gasoline, away from homes and shelters. Eliminate fuels such as sticks, pine needles, weeds, dried grasses, dead plants and trees. Maintain the roof and exterior of each structure. There may be little or no warning before a nuclear strike, so constructing or finding an expedient shelter may not be possible. In most cases, constructing a permanent shelter before it is needed is far more effective than counting on being able to improvise shelter when the time comes. Plans for half a dozen types of fallout shelters are available on FEMA’s website. Even if none of the designs works for you, you may still want to use ideas, construction techniques or suggested building materials the contain. If you can find a plan that works, it will save you some grief. If possible, locate the shelter away from outside walls and on the lowest floor of the structure. Basement shelters must be equipped with battery-operated carbon monoxide alarms. Place the entrance so that is does not face an exposed wall. A room constructed of concrete block can add protection to a wood framed home, but shielding must also be added to the roof. This can be accomplished by installing plywood to the ceiling joists. Screw the plywood securely to the joists and support it with joists and screw jacks. Then fill in the cavities between the joists with concrete block or brick. The block or bricks in the ceiling will shield the shelter from fallout accumulation on the roof above. The result is a shielded room in the center of the basement that makes use of both shielding and available distance to reduce exposure. When occupying a shelter built inside a home, close all windows and doors and seal any unnecessary vents to prevent the accumulation of fallout inside the home. Note that the air itself does not become radioactive, but only fallout particles that will be suspended in the air for a time. A complicated air filtration system is not necessary to filter fallout particles out of the air. A properly-designed air-intake will cause fallout particles to fall out of suspension. Wetted cheesecloth or a wet bedsheet will provide adequate air filtration for a DIY fallout shelter. Do not seal the shelter so tight that the occupants suffer carbon monoxide poisoning.